The world has seen a lot of horrific events this year. The Syrian civil war is still going on, Yemen is being torn apart as millions of its people face starvation, and deadly terrorist attacks have taken place from the US to France to Somalia. Closer to home, here in Asia, the expulsion of the Rohingya minority from Myanmar has been a terrible tragedy. Over 550,000 Rohingya have been forced to flee their homes and hundreds were killed by their own country’s military, in August and September, ending up in crowded refugee camps in neighboring Bangladesh. As a result, the UN has condemned Myanmar for ethnic cleansing, and many countries have also criticized it. Myanmar leader and Nobel Peace Prize winner Aung San Suu Kyi’s aura as a human rights icon has also been shredded. While the situation has calmed down a bit, the fact is over 550,000 Rohingya are trapped in Bangladesh refugee camps and unable to return to Myanmar. Myanmar has become a rising star on the world travel scene in the past few years as it has opened up to the world and shed its authoritarianism. I went there myself a couple of years ago. I thought that its opening up politically and economically was a very positive development, especially the fact that it allowed democratic parliamentary elections to be held just years after. But sadly, its democratization has not prevented the violent actions against the Rohingya. There are no sanctions against going to Myanmar and the conflict is in Rakhine state, on the country’s western border away from Yangon and the main tourist attractions. But the actions of the military, which used to govern the country and still retain a lot of control, in killing and forcing out the Rohingya should put a stop to Myanmar’s image as an idyllic and tranquil travel destination for the time being. Travelers should consider whether they want to visit a country that is engaged in widespread, targeted violence against a vulnerable subset of its own people. While some might think a distinction should be made between the country and its people, the sad fact is that a lot of Myanmar people support the campaign against the Rohingya, which is a probably factor behind Aung San Suu Kyi’s reluctance to condemn the violence. Personally I would rather not visit a country in which the government is perpetuating large-scale acts of violence and repression against people. For the same reason, I am not too interested in visiting Xinjiang or Tibet in China, and neither would I have wanted to go to South Africa, actually a fantastic country in the current era, during apartheid. But if one were to go, I hope travelers can be aware of the Rohingya tragedy and be mindful of the government’s deliberate actions. The Rohingya are a Muslim minority who have lived in Rakhine for supposedly hundreds of years but the Myanmar authorities see them as foreigners — Bengali migrants from Bangladesh who came over during the British colonial era. As a result, the Rohingya are virtually stateless in their own country, being unable to properly integrate into society due to being banned from getting national IDs, and using regular social services like education and medical care. The state has cracked down on Rohingya several times in the past few decades but these have worsened in the last few years. Between 2012 and 2015, violence against the Rohingya resulted in droves of them fleeing in boats to countries like Thailand and Malaysia, who rejected them initially, and photos of wretched, starved Rohingya on crowded boats filled international media. It is also notable that regional body ASEAN, as well as China, which itself is certainly no human rights champion, and India, has not spoken out at all against Myanmar. To me, this just emphasizes the toothlessness of ASEAN and its feeble mandate for regional cooperation beyond economic trade. This is an attitude not just limited to Southeast Asia, but to much of Asia in general. China is a large, vast country with an area of 3.7 million square miles and though the majority Han make up 90% of the population, has over 50 ethnic groups. As a result, beyond the teeming megacities and factory zones, and the heavily populated Han-majority provinces, there is a lot of ethnic and societal diversity. This is what former Sunday Telegraphy China correspondent David Eimer explores in The Emperor Far Away: Travels at the Edge of China as he travels to the edges of modern China. A well-known Chinese proverb goes “The mountains are high and the emperor far away.” What this means is that in the outer reaches of the empire, the emperor is a remote figure and so is his rule. The modern equivalent of that saying is true in areas like Yunnan Province and the fringes of the Northeast. There, the government’s rule is not as firm as everywhere else in the country, and local non-Han minorities and cultures still thrive. In Tibet and Xinjiang, the very opposite is true as the full force of the regime is imposed, ranging from heavy army and police presence to repressive measures limiting or banning local religious practices and languages. Not surprisingly, these areas – Xinjiang, Tibet, Yunnan and the edges of the Northeast – are often considered exotic and fascinating to both foreigners and the Han (the dominant majority in China) Chinese. But there is also a tragic element to several of the peoples in these areas as well, as Eimer examines how these minorities like the Tibetans and Uyghurs fare after decades of Communist rule. The situation in Tibet and Xinjiang, the most restive and repressed areas in China, is not surprisingly, rather bleak. Heavy-handed policing and harsh measures enacted against the locals have generated significant anger, the result of which can be seen now and again in the news with “terrorist” attacks in Xinjiang, which raise fears of an insurgency, no doubt played up by the government to justify their taking even harsher measures. Not only are Tibetans and Uyghurs not able to speak their language at schools or freely practice their religion, but their movements are restricted through measures like making it extremely hard to get passports, and they are unable to integrate into mainstream Chinese society. In Yunnan, the province that has the most minority peoples in China and borders Thailand and Myanmar, a Wild-West atmosphere prevails in much of the borderlands. Here, the government practices a looser form of border control as there are several tribes who peoples live across different countries like the Tais. A thriving cross-border criminal trade exists, especially in narcotics. 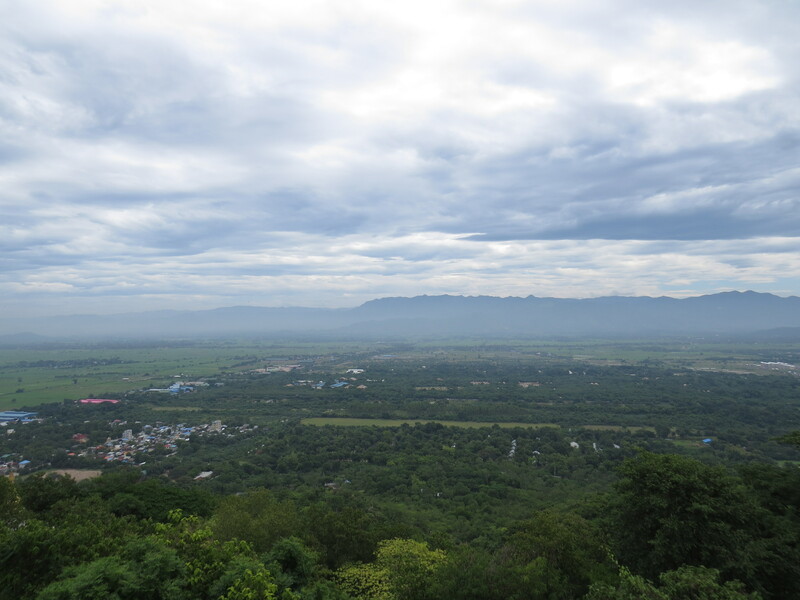 Eimer manages to travel across to Myanmar where he visits areas populated by minority tribes and controlled by drug armies, descendants of KMT soldiers who fled to Burma and stayed to cultivate opium. The Northeast is more sedate, though the vast icy landscape belies the economic dominance of China compared to Russia just across the northerneastern-most border. In this area, Small ethnic groups, including the descendants of nomads, cling on while facing the obsolescence of their language and customs due to decreasing numbers, intermarriage with the Han, and modern-day integration. This is already the fate of the Manchus, a Northeast people who ruled all of China as the Qing Dynasty for over 250 years up to 1911. Interestingly, the ethnic Koreans in the Northeast provinces are allowed to have their own schools where classes are taught in their own language. There is also interaction with North Koreans across the border in the form of trade, people smuggling and marriages, but this is starting to get clamped down on by the government. It is a book rich in travel, historical and ethnographic detail about a China so much different from the one often portrayed in more conventional travel books, whilst not shying away from illustrating the repressive rule of the Communist Party. It is also sad to ponder the fate of all the peoples mentioned in the book, many of whose cultures and languages are under threat in one way or the other. Simply put, The Emperor Far Away is about a China that is rapidly disappearing. 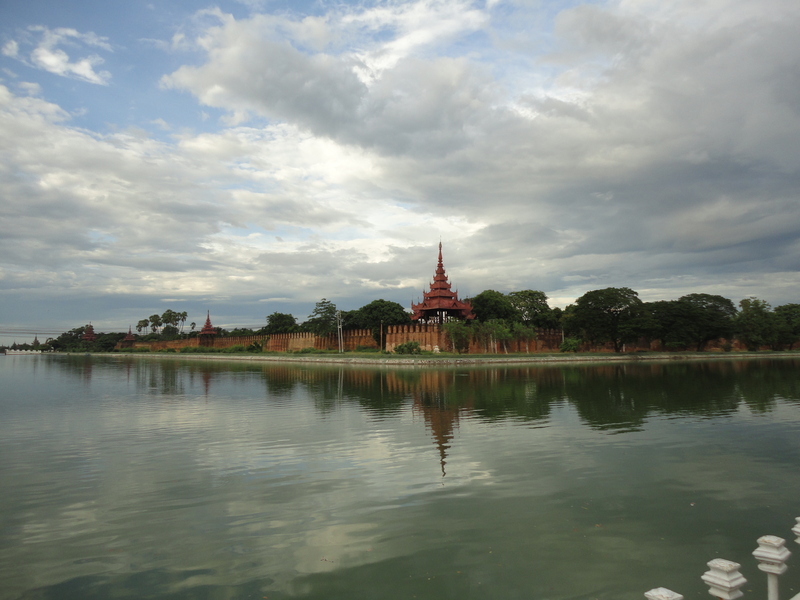 My last travel post about Mandalay was actually about the ancient royal towns around the city, so this one is about Mandalay proper. The city may be Myanmar’s second city and the former royal capital, but it isn’t exactly a tourist hotspot. 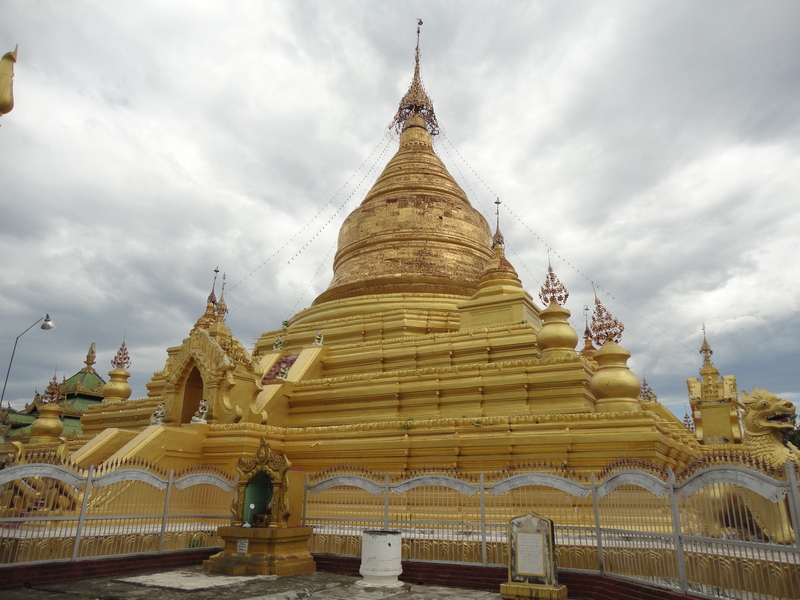 One reason is the country has other more interesting places like the former capital Yangon (Rangoon), the ancient temples of Bagan and myriad scenic destinations like Inle Lake. Another reason is that bombing during World War II destroyed much of Mandalay’s royal palace, which was eventually rebuilt on the same site. Granted the rebuilt royal buildings probably look the same as the original and the complex itself is an incredibly large site completely surrounded by a moat, but it didn’t appeal to me so I didn’t visit. 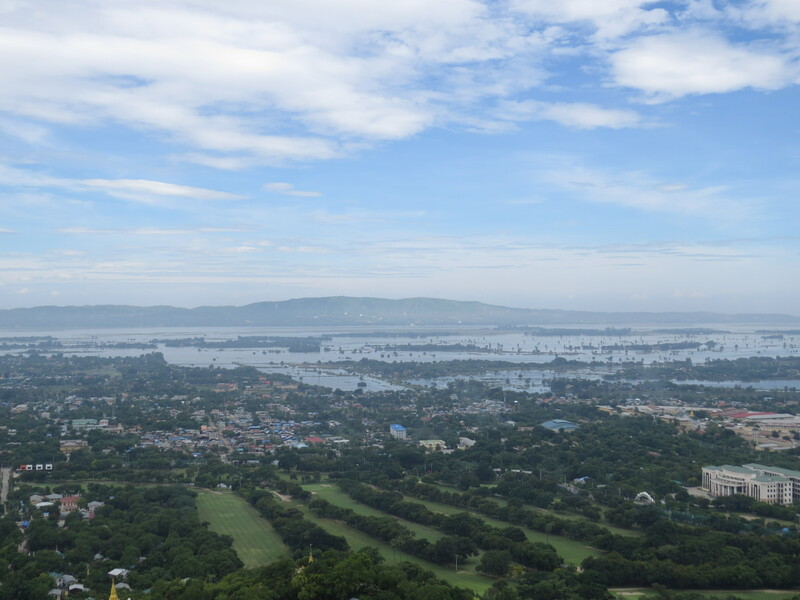 I instead went to Mandalay Hill, one of Mandalay’s main attractions which provides great views of the city, the Irrawady river and the mountains and plains to the north and east of the city. 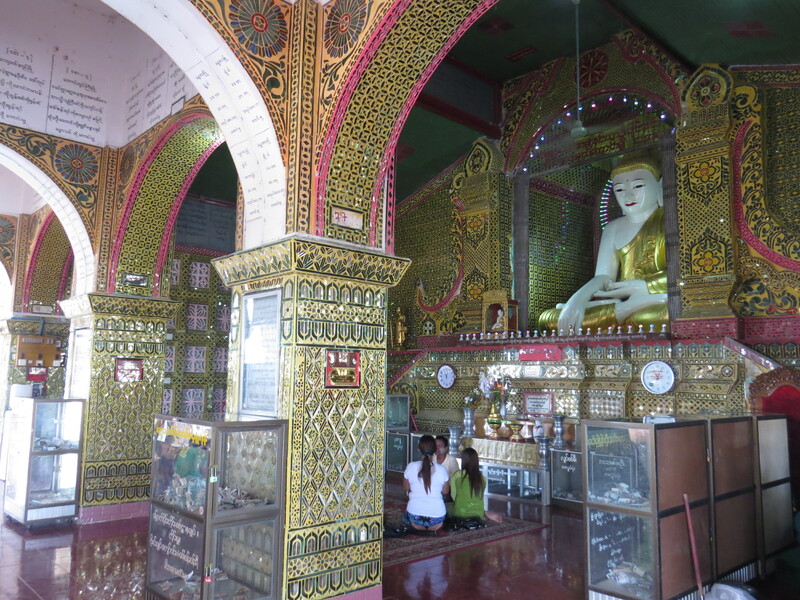 Mandalay Hill is also supposedly where the Buddha visited over 2,000 years ago and prophesied that a city would be built at its foot. Just 790 feet, Mandalay Hill takes less than a couple of hours to climb, but since it was so damn hot and I had a driver, I took the easy way up courtesy of his car. From the parking lot, I entered a building with an escalator that went to the top. 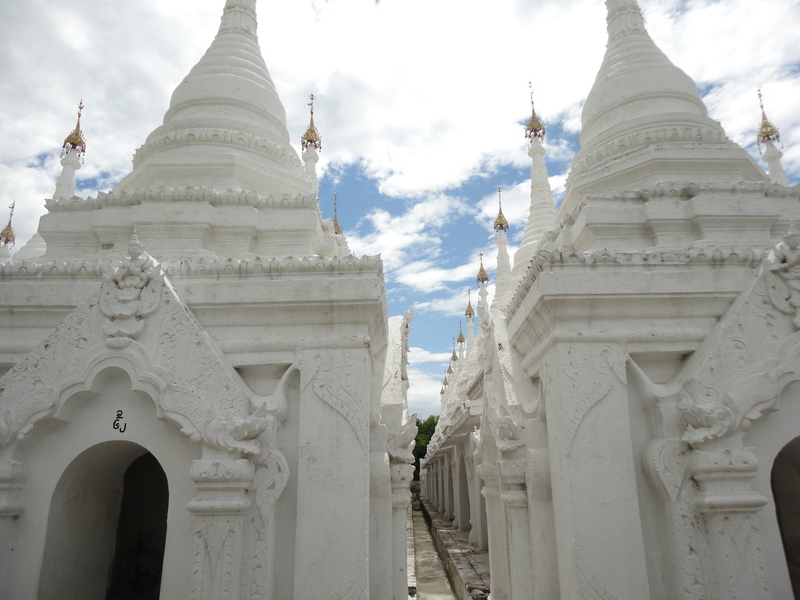 The hill has several temples on top, which is not surprising in this very religious country, at least in the Buddhist parts. 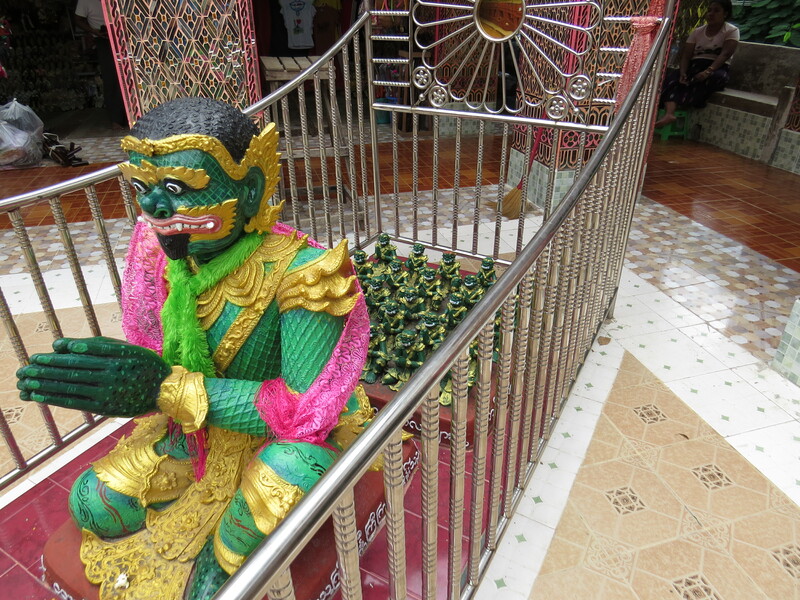 There were gleaming and ornate gold stupas, statues of hideous green cartoonish ogres and a female deity Sandamukhi who supposedly cut off her own breast to offer to the Buddha as a sign of her devotion, monks, and even sleeping dogs. There were also some locals, many of whom were themselves tourists, and they were flocking around white tourists to take photos (this happens a lot in China in smaller cities too). 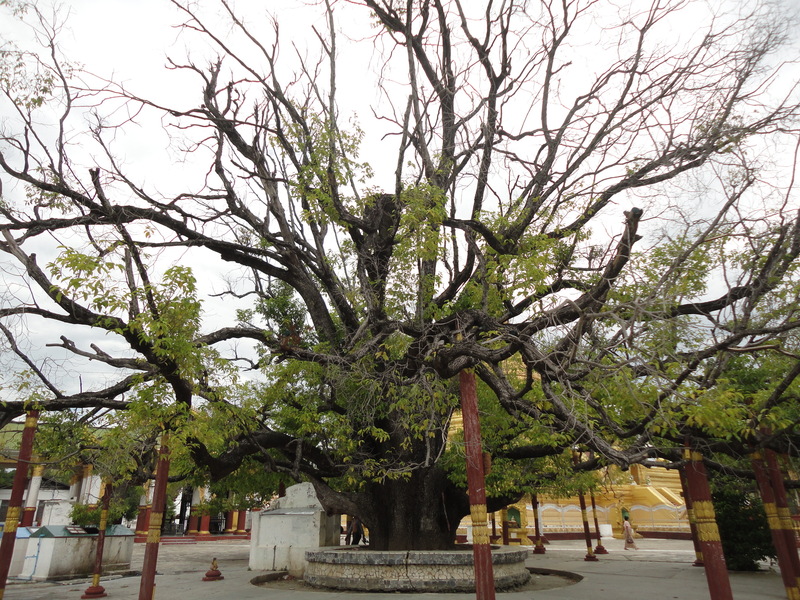 The ogre Sandamukhi who pledged devotion to the Buddha. I’m not sure if the dozens of little ogres behind her are her offspring. Back on the ground, my driver, the same one who had taken me to the places around Mandalay the previous day, took me to the Kuthodaw Pagoda which features over seven hundred of white stupas, each housing a [sculpted] page of Buddhist scripture, which together made up the world’s largest book. When I went inside, I was immediately met by two female postcard vendors, which happened many times at Bagan and other places. The first one left me when I promised to see her postcards when I was leaving, but the other one didn’t quite let up so easily and followed me a bit. I walked around to take in the sights, and I bought postcards from the first vendor as promised. As I was leaving, the second girl, who had a nice golden leaf design painted on her cheek, really got to work on her sales strategy. I tried telling her I had already bought postcards, to which she was having none of it, replying in charmingly broken English, “My friend happy, I not happy!” Whenever I tried to cut her off and say no, she’d say something like “Really? You buy from me? Please.” Usually I try to be firm with vendors who are too forward but this girl was just too much and I ended up buying postcards from her too. I then went to Sandamuni, which also featured a giant golden stupa and countless white stupas arranged in neat rows that collectively had a dazzling effect. 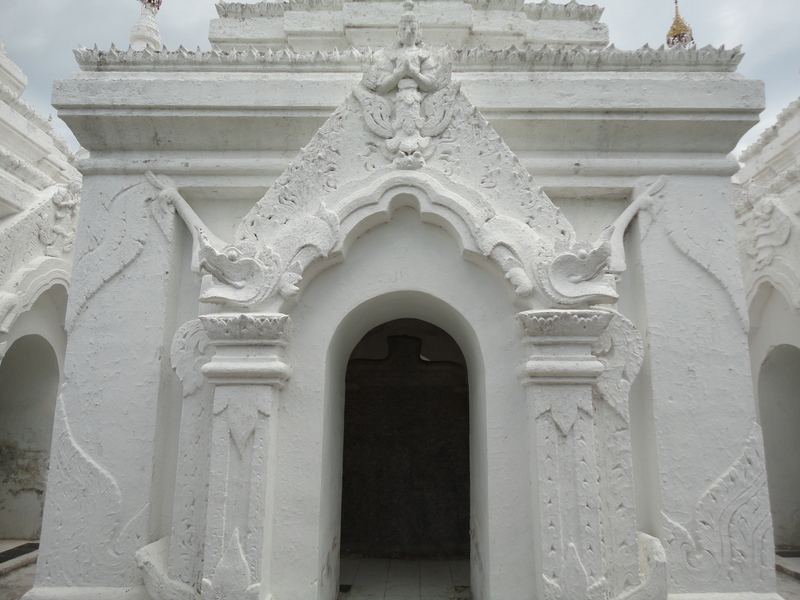 It resembles Kuthodaw Pagoda, though I found this one more attractive. 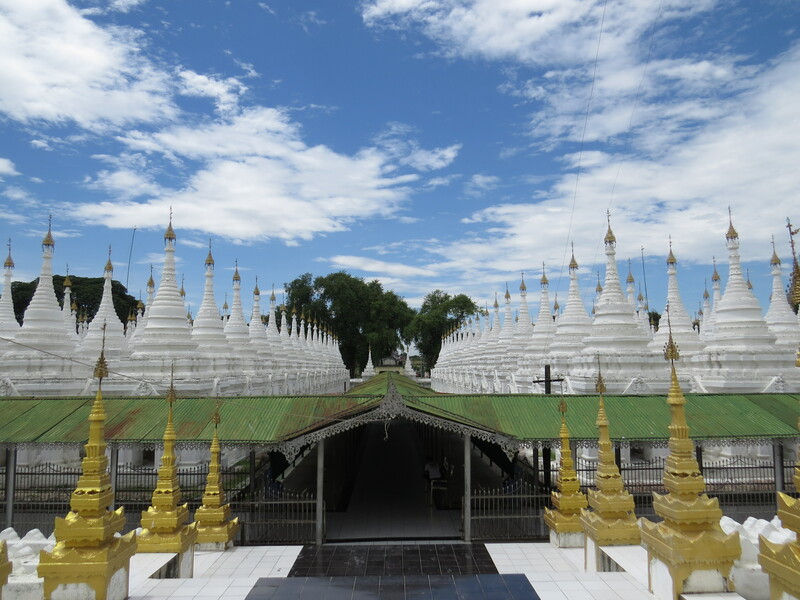 The over 1,700 stupas (not a typo) each house a slab featuring Buddhist teachings and commentaries, a vivid example of just how seriously the Burmese, those that are Buddhist in this case, take their religion. 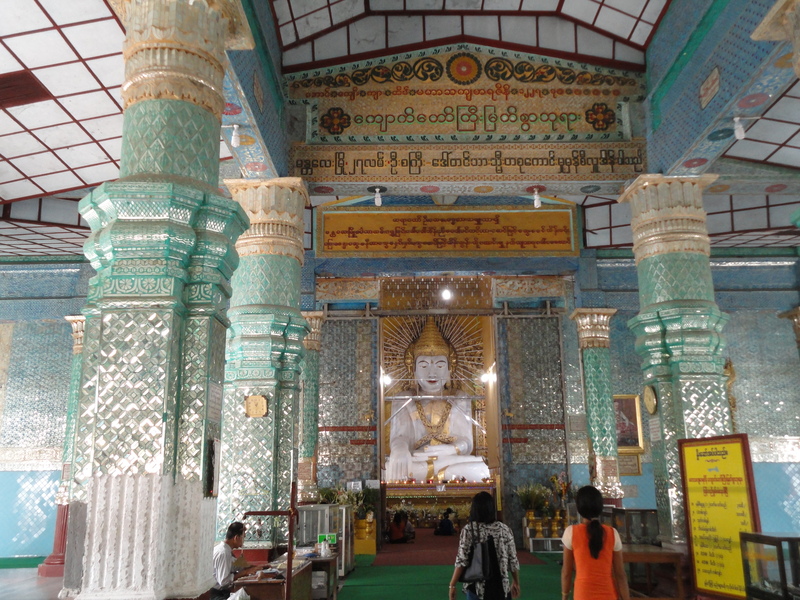 After Sandamuni, I stopped by a wooden teak temple and Kyauktawgyi Buddha Temple, which featured a massive hall with walls and pillars covered with green decorations. By then, I had had enough of temples and I was ready to head back. 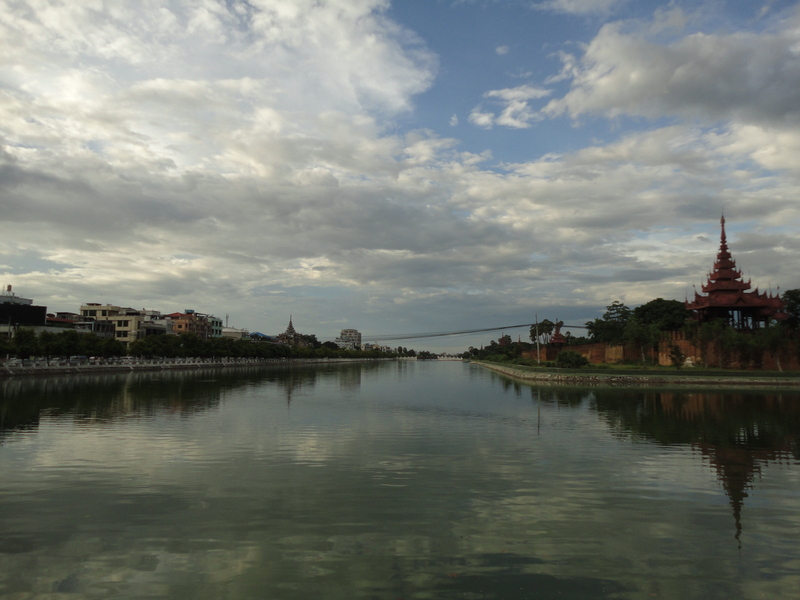 I left Mandalay later that night by overnight bus, which I had booked in advance. It was clean and spacious and I recommend it as an alternative to taking a plane or train. The journey back to Yangon was uneventful though at times, I felt a little jittery as the bus drove on the highway in near total darkness. By the time it was close to Yangon, the bus made a few stops where people got off and the emptier it got, the more apprehensive I felt about missing my stop. As it is, the final stop was the Yangon bus terminal which by then, I was relieved to reach. That is until in my early morning drowsy (6 am) and sleep-starved state, I accepted an offer from a taxi driver who was loitering in the station and ended up getting overcharged by him (lesson: never take taxis inside stations because they always overcharge tourists). What happened is he gave me a price, then as we were driving out, several guards stopped us and asked me what the driver charged. When they heard, they immediately told me it was too high and that the driver should charge me less. “OK, OK!” said the driver, but as soon as we drove off, he turned to me and said I had to pay the original price.